PVI provides remote technical support service to our current U&M customers. Our technical support team will use TeamViewer to log into the customer's computer to solve the problem. TeamViewer is a safe third-party software used by PVI's technical support team to set up a remote help session. Click here to download the executable file. Download TeamViewer in your computer. Once downloaded, the users can run the program. Users will see a window that contains an ID number and a password. 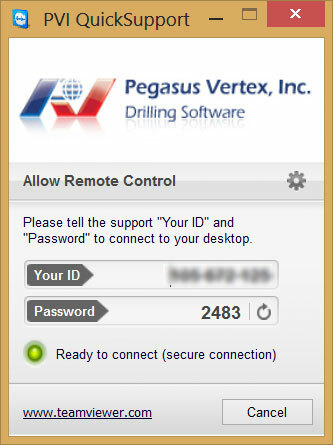 The ID number is specifically for your computer, and the password is generated each time you launch the program. Provide our technical support team the ID number and password to begin the TeamViewer session.